An Individual Voluntary Arrangement (IVA) is a formal debt solution between you and your creditors which can be set up when you cannot afford to pay your debts. It allows you to repay your debts with affordable monthly payments, over a set period of time (usually 60 months). It is a legally binding agreement which offers you protection from creditors and can assist with writing off some of your unaffordable debt. On completion of your IVA, the outstanding balance of debts in the IVA will be written off. An IVA is individual to your circumstances, therefore the level of 'debt write off' will depend on your total debt, affordability and will be subject to the agreement of your creditors. In the example below the individual contacted us explaining that they could no longer afford to pay their contractual payments of £523 per month on debts totalling £18,240. After determining if an IVA was suitable, we put forward their IVA proposal to the creditors, explaining that they could afford to pay £180 per month in the IVA. The IVA proposal was accepted by creditors. After the 60 monthly payments are made into the IVA, our client will have paid £10,800 back to their creditors. The remaining balance of £7,440 will be legally written off on completion. An IVA is suitable for you if you have debts of approximately £10,000 or more owing to two or more creditors and can afford to pay at least £100 per month into the arrangement. In order to determine if an IVA is a suitable option for you, one of our advisors will contact you by telephone to talk about your situation and advise how you can deal with your debt. You will be asked for details about your income, outgoings, total debts and any other relevant information needed, in order to provide you with the best advice. You will then be given the choice to decide how you wish to deal with your debt. If you wish to proceed with an IVA, you will require the assistance of a licensed professional called an Insolvency Practitioner (IP). An IP is the person who is legally qualified to prepare, negotiate and administer an arrangement on your behalf. All our IVAs are processed and managed by McCambridge Duffy Insolvency Practitioners, our sister company. There are 4 full time Insolvency Practitioners that work for the company allowing us to deal with everything in house. The IP will prepare your IVA proposal document and issue it to creditors for their consideration. Creditors will then be invited to vote on your proposal, which will allow for negotiations between us and your creditors. 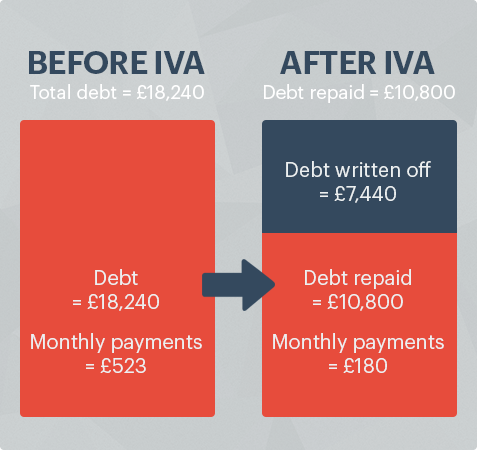 An IVA can usually be set up within 4 weeks from the date you first contact Debt Solutions. Once the IVA is approved you are legally protected from your creditors and you can start your agreed monthly payments into the arrangement. If you are interested in finding out more about an IVA, please phone us on 0800 043 0200 and one of our advisors will be happy to help. If you are a homeowner with equity in your property you may be required to introduce part of your share of this equity in the final year of the arrangement. If you can't get a remortgage, your arrangement can be extended for up to another year. Below are a few of the frequently asked questions we are asked in relation to our IVAs. If you have any questions please feel free to get in touch and we will find the answers you need. Can anyone propose an IVA? An IVA is an agreement to repay your debt at a level suitable for you and agreeable to your creditors. Each IVA is unique and tailored to your indivdual situation and has no 'set' criteria. To determine if you are eligible to propose an IVA, contact us. An IVA will usually last for 60 months. As stated above it can be tailored to suit your circumstances, so in some cases an IVA may be shorter, if you can repay the debt before the 60 month period. In other cases the IVA may run for longer than 60 months, if you run into difficulty with payments or you own a property with equity. You can do an IVA if you are a homeowner. If you have equity in your home you may be required to release some of it in the last year of your IVA. If this is not possible, then your IVA could be extended for up to 1 more year. There are a few different types of IVA which can be proposed depending on your circumstances. Each of these IVAs have been outlined below. A single IVA is a proposal solely in your name. It covers any debts in your name and any joint debts that you may have. The terms of the IVA will be dependent on your circumstances and the monthly payment will be based on your individual income and expenditure. An interlocking IVA is when two individuals propose separate IVAs that are mutually dependent on each other. When the IVAs are accepted they become interlocking and all creditors for both parties are paid from one joint monthly payment. A Lump Sum IVA is usually a shorter term IVA with creditors receiving payment via a "one off" lump sum which may be money from a remortgage or family member for example. The duration of an IVA such as this can be as little as 12 months. This is usually a single IVA where you can receive assistance towards the monthly payment from their partner or spouse. As with a single IVA, it covers any debts in your name and any joint debts that you might have. If you are self employed or operate as a sole trader then you can propose an IVA that will deal with both your personal and business debt, including any debts that you may owe to HMRC. This type of IVA could help your busines continue trading. Do creditors have to agree to my IVA proposal? When you propose an IVA, your creditors are sent a proposal document to consider. They are invited to vote on this proposal at the "Creditors Meeting" to confirm if they are willing to accept your offer of repayment. At this meeting, if more than 75% (by debt value) of the total creditors who lodge a vote, choose to accept your propsal, then the IVA is approved and becomes legally binding on all creditors in the arrangement, including those that did not lodge a vote. From time to time, some creditors may put forward modifications for you to agree to, before accepting your proposal. What happens when my IVA is approved? When your IVA is approved your monthly payments will commence at the amount agreed between you and your creditors. We will supervise the running of your IVA for it's duration, to ensure that you adhere to the terms agreed. You will be required to maintain contact throughout the term of your IVA and you must advise us of any changes in your circumstances. You may continue to receive correspondence from your creditors for up to 8 weeks following the approval of your IVA. This is usually for information only and you can direct any threatening correspondence to us. We can have an IVA set up for you in as little as four weeks providing you have all necessary documents returned to us promptly. If it is possible for you to continue banking with your current provider, then there would be no reason for you to have to change. If you have any outstanding debts with the same provider as your bank account, we would advise that you open a new bank account with a provider that you do not owe money to. The reason for this is that in some circumstances, a bank will freeze your banking facilities when notified of your IVA. What if my circumstances change during the IVA? You must contact us immediately to advise of any change in circumstances. The terms of the IVA can be adjusted to take these changes into account and where necessary a reduced payment can be proposed to your creditors. If your financial circumstances change for the better, then you will be expected to offer creditors a more favourable return where possible. What happens on completion of my IVA? You will receive a "Certificate of Completion" from us advising that your IVA is completed and you have satisfied your debts. Creditors will be asked to update their systems showing the completed IVA, which in turn should assist with the repair of your credit file. If you fail to adhere to the terms of the arrangement, then your IVA could fail and in some circumstances creditors will ask that you be made bankrupt. It is therefore imperative that you maintain contact with us at all times to try and avoid this happening. A CCJ does not impact your ability to propose an IVA. If your IVA is approved, any creditors that have a CCJ against you will become legally bound by the terms of the IVA and cannot pursue any further legal action against you whilst your IVA is in place. Yes. When you enter into an IVA your credit rating is affected right up until your IVA is complete. ON completion your credit rating will begin to repair itself. Can a creditor take legal action against me before the IVA is approved? If you are at threat of legal action being taken against you, or you have an impending bankruptcy hearing, then an application can be made to court for an Interim Order to protect you from your creditors until your IVA is approved. If you would like to discuss your options and find out if an IVA is suitable for you, then click here to fill in the IVA Application form. One of our advisors will be happy to chat with you and guide you in dealing with your debt. A fee is only payable where further services are requested. All fees will be explained in detail and discussed prior to commencement of any debt repayment plan. Repaying debt over a longer period may increase the total amount to be repaid. All our IVAs are processed by our sister company McCambridge Duffy Insolvency Practitioners. In the IVA our fees are included in your monthly payment to your creditors so you will not have to pay any more than you can afford. Read further information. Creditors may still contact you with promotional material or to fulfil contractual obligations to you but they should deal with us in all aspects relating to the outstanding debts. Acceptance of your IVA cannot be guaranteed. You must meet certain criteria which will be discussed with your advisor. Where we put a client forward for an IVA we believe they have an excellent chance of being accepted. Debts will only be written off where a client has made an agreed payment for a fixed period. In return the creditors agree to write off the remaining balance. Your credit rating may be impacted for up to six years from the commencement of you IVA. Homeowners may be required to introduce equity in the final year of the arrangement, if possible.